You'll be £60.00 closer to your next £10.00 credit when you purchase Men of the Battle of Britain. What's this? The book records the service details of the airmen who took part in the Battle of Britain in considerable detail. Where known, postings and their dates are included, as well as promotions, decorations and successes claimed flying against the enemy. There is also much personal detail, often including dates and places of birth, civilian occupations, dates of death and place of burial or, for those with no known grave, place of commemoration. There are many wartime head-and-shoulders photographs. Inevitably the high achievers who survived tend to have the longest entries, but those who were killed very quickly, sometimes even on their first sortie, are given equal status. The 2015 third edition will include new names and corrected spellings, as well as many new photographs. Plenty of the entries have been extended with freshly acquired information. The stated nationalities of some of the airmen have been re-examined and, for example, one man always considered to be Australian is now known to have been Irish. To people to whom all this is new it should probably be said that once you start randomly reading a snippet here and there you may be unable to put the book down. The human dimension will draw you in; just look at the cover photo: a bunch of freckle-faced young men, ready to mount their steed and ride into battle. The Battle of Britain Memorial Trust is behind this new edition that includes recently discovered photos, new aircrew entries and additional information for the original men listed. Almost 3,000 aircrew (pilots, air gunners and observers) are listed. All of this is contained within a large format hardback of more than 600 pages. Reading the book is like catching up with old friends. There are many familiar names, but it is those they share the page with that Wynn's work is at its most important. The layout is straightforward. The listings are alphabetical with full names, service number, nationality and postings during the Battle. Each entry is at least fifty words long and most include a photo. A short photo appendix appears to indicate image research is on-going. The writing is of high quality despite its brevity and, being a 'Biographical Directory', the men's pre-war and post-battle lives are detailed well. It is fascinating to read of an airman's actions during the Battle and then hope he survived the war. It is an encyclopaedia, a Who's Who and a bible all in one. As I love to do research myself in certain units from the Second World War, I'm always happy to receive such adorable "Monumental" books as Men of the Battle of Britain by Kenneth G. Wynn. First published in 1989 (with a second edition published in 1999) this book contains names of over 3,000 airmen (pilots, air gunners up to observers and more...) that participated in the Battle of Britain. It lists these brave men fully provided with a photograph (if available), a (small) biography of the airman, which squadron he belonged to and all other information you need! Nicely organised in alphabetical order so you have an easy search through the book. This book is just a remarkable reference source and in short: a must have book for all historians and "Battle of Britain" enthusiasts! 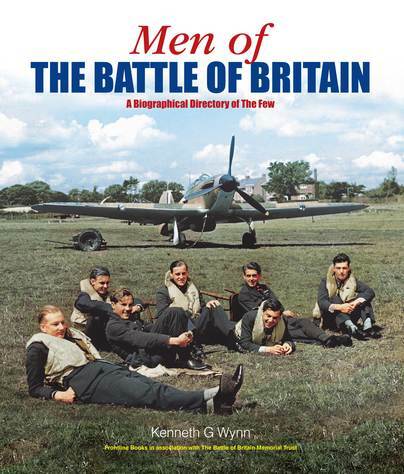 Kenneth G. Wynn did a phenomenal job to make this book a monumental work, tribute and 5-Star reference source on all the 'Unsung Heroes' from the Battle of Britain. This is very much a comprehensive reference book. Perhaps it would be most common to find this in the hands of academics and researchers but this is now the third edition of this book, updated in 2015 after it was first published back in 1989. It gives the individual details of all the airmen who served in the RAF during the Battle of Britain including information such as names, decorations, postings, units and usually some personal information such as place and date of birth, civilian occupations and the dates of death and places of burial/commemoration where available. This new addition includes new entries along with updates to previous content with corrected spellings, new photos and additional information which has come to light since the last print run. A large number of entries include a photo of the individual airman but some remain missing. The book is arranged in a basic alphabetical sequence and naturally you will find the entries for well known names such as Douglas Bader, Robert Stanford Tuck and so on, but also all the names of those other airmen who never came to be well known individually. These can include members of your own family or perhaps friends who your parents may have remembered. I found at least one who had been a friend of my own mother and who had been killed very early in the war. If you have an interest in the Battle of Britain, and in particular the men who made up 'The Few' made famous by Churchill's speech, then this is a reference book that covers those unsung heroes of this vital element of our WW2 history that you ought to have. The 606 pages are filled with a record of the lives of men who fought to defend our shores and who definitely deserve this lasting record of their devotion and for many of them, their sacrifice. It is a work of great dedication by the author to assemble and maintain this unrivalled work on the Battle. Personally I find this is the kind of long lasting reference that somehow deserves to be held in your hands as a paper copy and to occupy a place of pride on your bookshelf. This sorry subject very well researched and written up. I count myself privileged to have been at the IWM Duxford for a very special display that saw seventeen Spitfires in formation. It was surreal. Given the choice I am a Hurricanes man and was chuffed to see four of them and a Blenheim getting in on the act. There came a point when the Spits were wheeling about and the dulcet tones of Elgar ‘s Nimrod wafted under the Merlins. The message was about sacrifice and how much we owe to the men and women who fought and won the battle. Shiny planes are lovely things but people mean so much more. These are the inevitable days when the last participants are starting to leave us. While the pilots hold pre-eminence it is right to remember the supporting players and salute them. But the pilots reign supreme, a vestige of the aces of an earlier war as if they had the last of innocence before the bomber boys blew any frayed notions of chivalry away. Well that is simplistic claptrap, isn’t it? But it is a sentiment that has gained some credence depending what channel you watch. The Battle of Britain pilots have earned collective nobility we will honour for years to come and I hope forever – but times change and having the best available information about them is essential. I’ve said previously that the Battle of Britain book war has been intense but the big hitter is here like a night watchman coming into the middle order and smashing the ball all over the outfield for an innings saving fifty. I think a cricket analogy has it covered. This is the third edition of this monster but it is the first time I’ve seen it. The book is a substantial lump, like a Merlin engine block. It is neither cheap nor visually stimulating if I am honest and you won’t want to prop it on your lap unless you like getting pins and needles. Happily weights and measures do not apply to great books. This is a consummately produced reference work of stunning proportions. The thing lives and breathes as the author adds and subtracts names and details on the 3,000 pilots named in the previous editions. It remains a work in progress, definitive in every respect except, perhaps, in the mind of the author. He says as much in his introduction. The research goes on, there is no stopping. Even now tangible connections elevate pilots to the hallowed list or revisions relegate others. Maybe be there will come a point when a degree of backslapping goes on when there is nothing new to add. Perhaps our night watchman can come back into the pavilion at tea before declaring. The author provides an A to Z of airmen who fought in the battle for Britain. Most come with a thumbnail headshot and each has a pen portrait of essential details where known. Some remain mysteries, bringing to mind stories of men who arrived at a squadron and went straight off to die in combat before any introductions. It happened. The majesty of this book is in the decades of research and not in appearances. In actual fact it is crisp, business-like and easy on older eyes and very tidy. I like tidy. As a reference work it is gobsmacking. Last year I was stunned by Trevor Henshaw’s astonishing Great War aviation bible and here is something equally immense. I don’t think I can add much else unless we want to ponder how much life it represents. Maybe that’s a bit deep, but the Battle of Britain does this, still. Come back in five years to see how deep the connection is eighty years on. I will use this book. That’s what it is for. If you are doing any historical work related to the battle this book must surely be essential. It has authority and passion running through it and that’s about the measure of it. This book is actually the most special one on my book shelf. The book is a kind of bible of ‘The Few’ that flew in the Battle of Britain. Around 3.000 people that belonged to that ‘aircrew’ in those days are listed in this book with their name, rank, function, nationality, squadron, picture - if available - and a short history of their careers and life. Primarily they are ‘Pilots’, but also ‘Radar Operators’, ‘Air Gunners’, ‘Observers’ and ‘Wireless Operators’ are listed. The book is a tribute to the people to whom we owe that we can live in freedom nowadays. The unprecedented performance of these men in the summer and fall of 1940, turned the tide of WWII and this ensured that the Germans could not occupy the United Kingdom, herewith keeping a very important bridge head to the rest of Europe accessible for the Allies, which was also later in the war used as such. Churchill later spoke the legendary words about it; “Never, in the field of human conflict, was so much owed by so many to so few”. Better and more beautiful it cannot be described. From the 3.000 people that flew, about 500 would decease during the Battle of Britain. The people are listed in alphabetical order. The pieces of text vary in length, depending on the available information. They contain interesting information about the experiences of the aircrew such as types that were shot down by them, air battles they took part in, a plane which they accidentally bumped into escapes by parachute, etc. etc. Thus, exciting to read. This brilliant designed book with pages larger than A4 is with its 3 kg the heaviest aviation book on my book shelf and contains no data about the Battle of Britain itself. The book is, compared to the previous version, updated again with complementary information about the people and pictures. The work of Kenneth G. Wynn is, considering the nature of the information and the historical value the book has gotten through time, very valuable and the Battle of Britain Memorial Trust is at present co-publisher of the book. When you feel the book in your hands it already feels impressive and a more beautiful tribute on paper to ‘The Few’ could not have been made. Many thanks to Kenneth G. Wynn. The sixth star is for The Few themselves’. An updated much larger effort than Volume 1 – all aficionados should get this tome; it's quite outstanding! Great to see this title updated and back in print, the definitive work on the aircrews who fought in the Battle of Britain. Note that this is a directory of personal biographies, some detailed and others, understandably, more sketchy and does not cover any history of the battle itself. This however, is its great strength, in covering personal details not practicable in any of the myriad histories of the air campaign. The single absolute 'must have' in any B of B library! Having bought the previous edition of this massive volume some years ago, I am truly staggered at the latest edition which is superb and surpasses the previous addition. A dear late friend (John H.B. Burgess, 222 Sqn) of mine who fought in the battle is of course included and I feel the volume is a tribute to him and all the others who fought in the battle. A must for any WW11 or Battle of Britain enthusiast. Any war involves people, real people, so it is fitting that on Battle of Britain Day in 2015 I am reviewing this book, dedicated to the men who fought in that momentous event. This large book contains a brief biographical resume of each pilot, and air gunner, who fought in the Battle of Britain in August and September 1940. Inevitably, the amount of information available on each person does vary, but for most of the men involved, a reasonable amount of information is available in order to gain an insight into the background and service career of every pilot. The biographies are arranged alphabetically, and most contain a photograph of the individual concerned. I have not been able to put this book down for long since it arrived, and I have found it fascinating the eclectic mix of men, of different nationalities and a range of backgrounds, who came together in history to become ‘The Few’. Produced in association with the Battle of Britain Association, this was first published in 1989, but the re-print has only recently been available. It is expensive, but in my humble view, it is worth every penny, as a major work of reference for this key event in history. I have the previous edition of this for which I previously wrote a review here at Amazon UK, and which I gave 5 stars. This latest edition is a third larger and contains yet more information on aircrew and photos for those whose entries did not have one previously. The scope, scale and research of Mr Wynn's book cannot be overstated. This is a phenomenal and monumental work and a wonderful and fitting tribute to the men who turned Britain's Darkest Hour into her Finest. Quite simply the best book on The Few there is. A superb and monumental update of this marvellous book, first published in 1989. As a military historian who has concentrated on the RAF and in particular the Battle of Britain, this edition is a fitting way to commemorate the 75th anniversary. It is self evident much new research has been carried out, since the last edition, published in 2000. This includes many new photos and artists drawings of the participants. I congratulate all those concerned and would recommend this book to anyone with an interest in military history, the RAF and the Second World War. Grab every superlative you can think of and throw them away. None can come close to describing this book. It has a presence, a gravity, about it. It is not something that lends itself to being read cover to cover like a memoir but it draws you in and it is hard to stop reading, to stop discovering, and tear yourself away. Every page is one of interest, adventure, valour, courage and sacrifice. Flick through to a name you know and you will discover it surrounded by others of equal stature. One thing leads to another in this book and time seems to slip away. Time is slipping away for the last remaining Battle of Britain veterans and there will sadly come a day in the not too distant future when they are all gone. There will, however, always be this book. It is an encyclopedia, a Who’s Who and a bible all in one. It is Kenneth G Wynn’s Men Of The Battle Of Britain. For the first time we can tell the stories of 'The Unsung Few' who inexplicably fell under the radar of war historians following exhaustive research by author Kenneth G Wynn and his team. This standard and valuable reference work is a most highly recommended book. KENNETH G. WYNN was born in London and was at school there during the Battle of Britain. He later served in the RAF, before moving to New Zealand, where he has lived for many years. He has written books on New Zealand holders of the Battle of Britain Clasp, the Charge of the Light Brigade and U-boats.